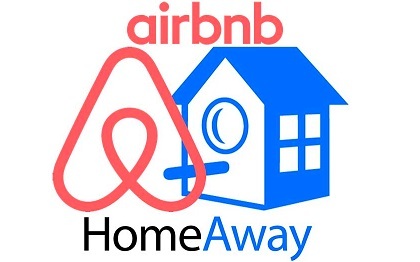 Sites such as Airbnb and Homeaway, have driven a huge 112% rise in searches for UK holiday rentals, catching hotel searches in the process, according to new research. Based on the online behavior of 3 million UK consumers, the Hitwise research has found that a high proportion of visits to holiday rental sites originate from social media channels, whereas in comparison 50% of hotel aggregator site searches came via search engines. The global house sharing industry is predicted to reach $169.7bn in revenue by 2019. Based on the online behaviour of 3 million UK consumers, the Hitwise research found that a high proportion of visits to holiday rental sites originated from social media channels, reflecting the value of share-ability in sites such as Twitter and Facebook for would-be travellers. In comparison, half (50 per cent) of hotel aggregator site searches came via search-engines. Searches across rentals and hotels were also clearly different. When searching for hotels, budget was evidently front of mind – searches for ‘cheap’ and ‘deal’ came out top. In contrast, holiday rental site seekers lead their searches with a different kind of holiday in mind, opting for terms such as ‘hot tubs’, ‘villas’ and ‘log cabin’. Searchers over indexing on holiday rental sites were found to be females aged 18-34, dominating 25 per cent of searches. In contrast, men aged 35-44 were the bargain hunters and most likely to be visiting hotel aggregator sites or a hotel’s direct website. 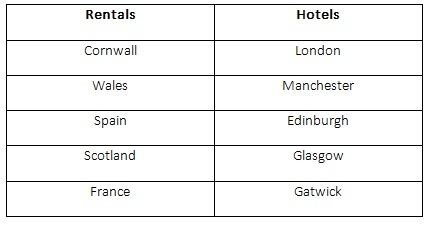 When it came to destination, London was the most the popular destination for hotel searches, whilst Cornwall took the top spot for holiday rental sites. Nigel Wilson, managing director at Hitwise, outlines how marketers can reach the right audience through understanding the conditions leading to a booking: “Trends are moving quickly because younger generations are embracing technologies to drive what they want – when where and how they want it. This no longer means bagging the best deal, but embracing the service that most closely meets their needs. Marketers must tune in to channel preference and booking requirements to offer the right people the best holiday. “Hotels are now required to digitally transform by adopting technologies such as data analytics and CRM to specifically target their most profitable customers. Global Hotel Alliance, for example, has adopted a successful loyalty programme which uses the same principles as airline frequent flyer schemes, collating customers’ membership status and personal preferences, which are recongised amongst all the hotels in the group. Using CRM systems such as this enables a hotel chain to combine the reliability of a hotel with the authenticity and personal touch of a rental to create a loyal customer base.